How’s this for a global racket that most people have probably never even heard of – the “pre-shipment inspection” (PSI) industry? This industry’s target market includes the world's most impoverished, corruption-ridden countries – places like Bangladesh, Bolivia, the Congo, Haiti, Kenya, Nigeria, Pakistan, Togo, and Zimbabwe, all of which have per capita incomes below $1000 a year, and also consistently rank in the bottom quarter of Transparency International’s annual corruption ratings. The industry is dominated by a tight-knit group of five global “competitors” that generates more than $800 million a year of revenue and $150-$200 million in profit from inspection contracts with 44 of these desperately poor countries. These companies’ owners include some of the richest people on the planet, who dwell in premier capitals like Geneva, London, Paris, and Milan, plus a 12th century Swiss castle and a 15th century Tuscan villa or two. In addition to its direct costs, the industry has many other harmful side-effects. After forty years, development specialists are finally realizing that it has probably actually discouraged bureaucratic reform, boosted trade barriers, and encouraged even more corruption than it has prevented. In fact most of these PSI companies cut their teeth on servicing the world's worst dictatorships, including Mobutu's Zaire, Suharto's Indonesia, Marcos' Philippines, and the current crop of autocrats in Uzbekistan and Kazahkstan. They have also recently been convicted of bribing senior Third World officials to secure PSI contracts. For example, as we'll see, in the case of Pakistan, a recent Swiss magistrate's decision in a long-fought court case indicates that SGS and Cotecna Inspection SA, two of the industry’s long-time leaders, really did bribe Benazir Bhutto, the former Prime Minister of Pakistan and leading members of her family throughout the 1990s, with the help of major Swiss, American UK, and French banks and a coterie of Swiss lawyers. In effect, all these "Western" institutions helped to undermine Pakistani democracy and its chances for providing a democratic alternative to Islamic fundamentalism and military dictatorship. In these times, when the cause of Islamic democracy has belatedly become a rallying cry for US foreign policy, this is an important missed opportunity for us to understand. Despite this dubious track record, the World Bank, the IMF, and the UN have failed to discipline these PSI companies. Indeed, they have often even insisted that developing countries hire them, and have hired several of these companies themselves, to police programs like the World Bank’s “anti-corruption” standards and the UN’s (pre-invasion) Iraqi “food-for-oil” program! Welcome to the curious world of “pre-shipment inspection (PSI)” services – a First World-based industry that is really a throw-back to the “tax farming” of the Middle Ages, when European governments outsourced tax collection to private agents. The PSI industry’s value proposition is quite similar to the medieval one. Because of rampant corruption, many of the world’s poorest countries distrust their own customs bureaucracies and export agencies, so they are willing to hire expensive private firms to backstop them, in effect privatizing” the collection of duties and foreign exchange earnings. 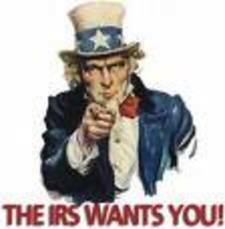 As in the case of medieval tax farming, the remedy has often turned out to be worse than the disease. Our examination of the PSI industry also revisits the corruption allegations that surrounded Pakistan’s former Prime Minister Benazir (“Pinky”) Bhutto, who held power during two very influential periods in the 1990s. In the late 1990s, there were numerous stories in leading Western papers like The New York Times about her alleged involvement in corruption. As we’ll see below, the substance of these stories has recently been confirmed by developments in several Pakistani and Swiss court cases. Indeed, Bhutto and her husband, Asif Ali Zardari, have recently been convicted in a Swiss court of having profited enormously from bribes that were paid by a wide variety of First World companies, including several in the PSI racket. However, our perspective here is a bit different from that of the original newspaper reports on this scandal, which focused on the Bhuttos’ corrupt behavior, with much less attention to the Western companies, banks, and lawyers that facilitated it. Recent court cases have also added greatly to our knowledge of precisely what transpired in this case. If the West is really serious about encouraging “democracy” in Islamic countries like Pakistan, this is a good place to start -- for it shows that "reform" is not only a matter for developing countries. As global industries go, the PSI industry is relatively young. It was born in the Congo (formerly “Zaire”) in the mid-1960s, after Joseph Desire Mobutu declared himself President-for-Life in 1965. With backing from the Belgian secret service, the CIA, and the UK, Mobutu, a former journalist and army commander, helped to organize the September 1960 ovethrow of the left-leaning, if duly-elected, nationalist, Patrice Lumumba. 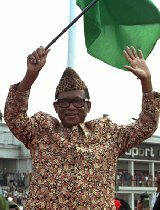 With substantial help from the US, by 1965 Mobutu had consolidated power, which he ended up retaining until he died of pancreatic cancer in September 1997. In the process, he turned his country into a private fiefdom for he and his family, and an abattoir of corruption and repression. The original concept behind the PSI business was that foreign inspectors employed by companies like SGS would examine exports to Zaire before they left, to verify contents, tariff classification, and price levels, and make sure there was no over-invoicing. SGS compiled the data and share it with the country’s Finance Minister or, in Mobutu’s case, the Life President himself. PSI was not SGS’ first business. By the time Mobutu became a client, this Swiss family-owned company was already ninety years old, with a solid customer base in industrial testing and trade certification, and scores of testing facilities all over the world. Its original role had been to certify goods destined for foreign buyers, and it also traded commodities. However, with the encouragement of the IMF and the World Bank in the 1980s, SGS’ largest and most profitable activity came to be the provision of PSI services to developing countries like Mobutu’s Zaire, Marcos’ Philippines, Moi's Kenya, and Suharto’s Indonesia, where in 1985 SGS signed its first deal that focused primarily on customs duties. By the mid-1990s, SGS had offices in 140 countries, up to 39,000 staff, and more than $1.2 billion in revenues – a quarter from PSI services for developing countries. By then, several other firms had entered the market, including Intertek, BureauVeritas, BSI Inspectorate , and Cotecna Inspection SA, which SGS acquired in 1991-94, and then sold back to its owners in 1997. (See below.) However, of the 29 developing countries that had signed PSI contacts by 1994, SGS accounted for more than a third. All this was very good news for SGS’ shareholders, not only its Swiss founding family, but for three other key investors who had acquired effective control over the company. These included the German mult-billionaire Baron August von Finck, whose family came to control a quarter of SGS’ voting stock; the Agnelli family (owners of the Fiat Group), which controlled at least another quarter of SGS by way of Worms & Cie, a Paris-based private equity firm that the Agnellis had acquired in 1990; and SwissLife, Switzerland’s leading insurance company, which ultimately acquired about ten percent. Baron von Finck, in particular, was one of Germany’s most influential business people. In 2003, Forbes estimated his net worth at $5.6 billion, which made him the world’s 52nd richest person. 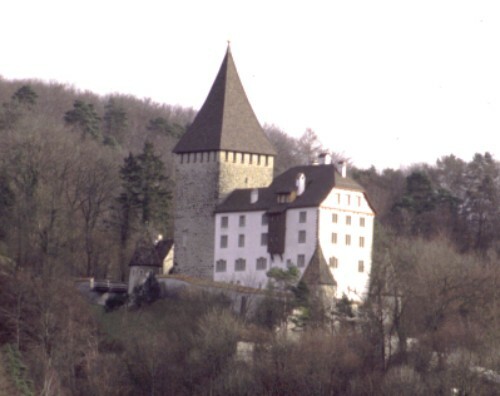 In 1990 the Baron sold the Munich bank to Barclays Bank and moved to Switzerland, where he now resides in Schloss Weinfelden, a twelfth-century Swiss castle. In addition to his SGS holdings, he and his family still own the Swiss restaurant and hotel chain Movenpick, half of the leading German brewery Würzburger Hofbräu, the U.S. gold mining company Homestake Mining, and at least five percent of Allianz AG, which is now a leading global insurance and asset management giant whose ads are now featured prominently on the nightly news in the US. Until 1999 Finck, his brother, and his son also owned Alusuisse-Longa, Switzerland’s only aluminum company, and until October 2003, Spaten, Dinkelacker, the Munich brewery that produces Lowenbrau. As Allianz AG itself now admits, its behavior during the Nazi era was execrable. One of its key managers, Kurt Schmidt, served as Hitler’s Economy Minister from 1933-35, and then returned to Allianz as its CEO. The firm cultivated very close relations with leading Nazis like Hermann Göring and Heinrich Himmler in the 1930s, helped the Nazis seize insurance proceeds that belonged to the Jewish victims of the 1938 Kristalnacht pogram and the Holocaust, and even provided insurance to the Nazi SS for Auschwitz’ death camp facilities. In 2000, Allianz was one of several Germany companies that contributed to a DM 5 billion ($3 billion) fund for Holocaust victims, including 300 million marks for those who’d been robbed of their iinsurance. Of course no amount of financial aid could compensate victims like James Freudenberg, the former Chairman of Allianz’s Frankfurt subsidiary who was forced to resign in 1934, and ended up being murdered at Auschwitz in 1944 – presumably in the same facilities insured by his former employer. From the 1960s on, SGS’s strategic role in developing countries made it a convenient perch for several First World institutions that wanted to monitor global trade and corruption. In the early 1980s, for example, the World Bank and the IMF started to insist that developing countries that received their financial assistance hire outside PSI companies like SGS. In June 1996, the World Bank President, James Wolfensohn, selected SGS as the Bank’s very first global programs auditor, as part of its new “spot audit” program to get tough on project corruption in developing countries. As noted below, in 1992 and again in 1999, the UN also hired Cotecna, an SGS subsidiary from 1991 until 1997, to police its “oil-for-food” program for Iraq. Meanwhile, SGS also acquired some interesting high-level connections in the intelligence community. For example, R. James Woolsey, who served as CIA Director from 1993 to 1995, listed SGS as one of his key clients while he practiced law from 1991 to 1993, during a brief break from government service. When he returned to private practice from the CIA in 1995, he once again listed SGS as one of his key clients at the leading Washington D.C. law firm of Shea & Gardner, until he left the firm to join Booz Allen Hamilton in 2003. (SGS remains on Shea & Gardner's client roster.) As we will see shortly, these must have been instructive times for former CIA Director Woolsey to have been “of counsel” to SGS. Of course no global enterprise with thousands of employees in dozens of developing countries can really be expected to be “Snow-White” all the time. But it is ironic that First World companies like SGS, which are supposed to be engaged in the very business of fighting corruption, have sometimes actually turned out to be among the worst offenders. Indeed, like many other Swiss companies and banks, SGS’s corporate culture appears to have tolerated and even encouraged such behavior, with a kind of "its only the wogs" mentality. In September 1997, just a year after SGS received its World Bank appointment, the firm was revealed to have been deeply involved in bribing Pakistan’s former President Benazir Bhutto, her husband Asif Ali Zardari, her brother-in-law Nasir Hussain, and several other intermediaries. The payments, which totaled about $15.0 million, were made by way of shell companies in the British Virgin Islands, Swiss lawyers, and several Swiss bank accounts, including severral at the Geneva offices of UBS, Barclays Bank, office, and Banque Pasche. They were intended to help SGS and Cotecna, a competitor that SGS acquired in 1991-94, win lucrative Pakistani government contracts for PSI services. Such high-level transnational corruption naturally requires “supply” as well as “demand.” In Pakistan’s case, a significant part of the “supply” during the early 1990s was provided by Mohtarma Benazir “Pinky” Bhutto and her husband, Asif Ali Zardari. "Pinky" Bhutto was the Harvard- and Oxford-educated daughter of former Pakistan President Zulfikar Ali Bhutto, the scion of one of Pakistan’s richest land-owning families in the Sindh, a rural, semi-feudal southern state where landlessness and debt slavery remain common even today. 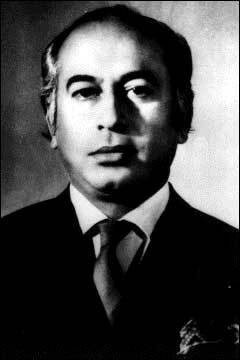 He founded the Pakistan People’s Party in 1967 and served as the country’s President from 1971 until 1977, when he was overthrown and hung by General Muhammad Zia-ul Haq. In November 1987, 34-year old “Pinky” married the 36-year-old Zardari, a polo aficionado and minor local businessman, and in November 1988, she was elected Pakistan’s Prime Minister, running on the PPP ticket after General Zia died in a mysterious plane crash. Pinky’s first election was greeted with very high hopes, both in Pakistan and around the world. Huge crowds had greeted her upon her return to the country from a lengthy period abroad in 1986. Well-educated, bright, articulate, attractive, from a land-owning family that was supposed to be too rich to be bribed, she was Pakistan’s youngest Prime Minister ever, and its only female one, in a country that was 97 percent Muslim. It was widely expected that she would provide her country a moderate, democratic alternative both to military rule and to the incipient fundamentalism that was just then taking root among Pakistan’s Islamic parties. Unfortunately, it soon turned out that Pinky’s election had actually opened the door to a host of “avaricious politicians,” including her own husband, mother, brother-in-law, and herself. And the main type of “support” provided by the First World to Pakistan was not for democracy, but corruption. One of the key First World players in the SGS scandal was a crafty 40-something Geneva lawyer named Jens Schlegelmilch, the Bhutto family lawyer in Europe. In the early 1980s, according to Swiss prosecutors, he had helped Benazir’s mother, Begum Nusrat Bhutto, establish offshore residency. Before that, he may have also helped the Bhutto family set up offshore accounts, including several at Swiss banks. 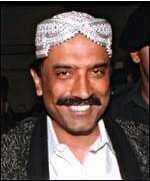 Schlegelmilch attended Pinky’s wedding to Zardari in 1987, where he reportedly met Zardari for the first time. Schlegelmilch lost no time in deepening this relationship. In early 1990, he allegedly negotiated an arrangement whereby one of SGS’s competitors, Cotecna, agreed to pay Madame Begum Nusrat Bhutto a 6 percent commission on a new PSI contract with Pakistan, by way of Barclays Bank (Suisse) S.A. (Account # 622.902) and Mariston Securities Inc., a BVI company that Schlegelmilch administered on Nusrat’s behalf. By August 1990, Nusrat had reportedly received $1.2 million under this Cotecna arrangement. The relationship was briefly interrupted in August 1990, when Pinky was suddenly dismissed on corruption charges by the country’s President, Ghulam Ishaq Khan. In just 18 months in office, she and her husband had provided Khan with enough justification to file six judicial cases against her for corruption and misconduct. Zardari, Pinky’s husband spent the next two years in jail on these charges. However, Pinky’s successor, the Islamic Democratic Alliance’s Nawaz Sharif, proved to be equally corrupt, and was also dismissed by President Khan on corruption charges in April-July 1993. By then, none of the cases against Pinky had been decided. So in October 1993, when the PPP won another national election, Pinky became Prime Minister again. She acquitted herself of all the charges, released her husband from jail, and he and Schlegelmilch went back to work. One of her government’s first acts was to award a new PSI contract. SGS had acquired a controlling interest in Cotecna in 1991, so this time around it was SGS’ turn to exert influence. In March-June 1994, according to the Swiss investigating magistrate’s July 2003 final report on the case, executives reportedly promised to pay commissions totaling 10.25% percent of its contract value to several new BVI shell companies that were controlled by Zardari, Pinky’s brother-in-law Nasir Hussein, and Schlegelmilch himself. According to Schlegelmilch’s deposition in the case, in 1994, two wire transfers for a total of $1.325 million from SGS and Cotecna Inspection S.A., by then an SGS subsidiary, were made to Bomer Finance Inc., a BVI company whose beneficial owners were Zardari and Pinky. In return, on September 29, 1994, SGS/ Cotecna secured an exclusive, non-competed “pre-shipment inspection” contract from the Government of Pakistan. By September 1997, when some of these matters came to light, SGS had earned at least $137 million under this 1994 Pakistani contract, and it therefore owed the couple and Schegelmilch about $15 million. Between March 1995 and September 1997, Zardari’s Bomer Finance Inc. received $8.2 million from SGS and Cotecna. Nasir Hussain’s Nassam Overseas Inc. received $3.81 million, and Schlegelmilch himself pocketed $1.53 million from SGS/ Cotecna and another $.5 million from these shell companies. Once again Pinky got caught with her hand in the cookie jar. By late 1996, corruption rumors about Zardari’s sidelines were flying, in the run-up to the election scheduled for February 1997. In September 1996, Pinky’s elder brother Murtaza -- a radical, who was actually one of her key opponents -- was gunned down by the state police in Karachi, and her own mother Nusrat pointed the finger at Pinky and Zardari. On November 5, 1996, Pinky was once again dismissed on charges of corruption and extra-judicial killings by Pakistan’s President – this time by President Farooq Ahmed Leghari, a member of her own party. 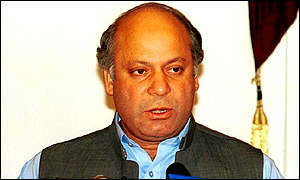 Nawaz Sharif returned to power, where he remained until he was overthrown by General Pervaz Musharraf in March 1999. In 1996, Zardari headed back to jail, charged with Murtaza’s murder and several others, plus numerous corruption charges. He’s been there ever since. Pinky and Nusrat fled to London and Dubai. This second ouster eventually permitted the whole SGS matter to come to the surface. In September 1997 SGS suspended Hans Fischer, a senior manager who had been in charge of SGS’ entire Government Services Division, and in 1998, Fischer, Schlegelmilch, and Robert Massey, the Managing Director of Cotecna Inspection S.A., were all indicted in Switzerland on charges of money laundering. The Swiss magistrate also asked Pakistan to institute money-laundering charges against Bhutto and Zardari. Like most high-level transnational bribery and money laundering cases, this one has taken an eternity to be resolved. In the interim, Pinky Bhutto has continued to roam the world, grandstanding about democracy, women’s rights, terrorism, and all the injustices that she and her family have supposedly suffered at the hands of Pakistan’s military rulers. Evidently she really believes that she still represents her country's leading "democratic" alternative, and that all of these scandals will not prevent her from regaining power a third time. In April 1999 Pinky and Zardari were both convicted in a lower Pakistani court of accepting at least $9 million in bribes from SGS. They were fined $8.6 million, received five-year jail terms, and were banned from holding seats in parliament for seven years. They appealed, while Benazir remained in London and Zardari sat it out in a Karachi jail. In April 2001 their convictions were reversed and she and Zardari were granted new trials, when tape recorded phone conversations turned up showing that a judge had been instructed on how to rule in the case by senior officials in Nawaz Sharif’s government, in exchange for a diplomatic passport. However, in October 2001, a Pakistani appeals court upheld a three-year sentence given to Nusrat Bhutto for understating her assets. In May 2002, Pakistan’s Accountability Court sentenced Pinky to three years in prison for deliberately avoided the court. And in September 2002, an anti-corruption court sentenced Zardari to seven years in prison in another corruption case involving a 40 million rupee commission on a 130 metric ton steel converter at Karachi’s Pakistan Steel Mills. By then he had been in jail seven years, having been tried unsuccessfully in six other criminal cases and seven accountability cases. The judge could have elected to count this time toward his new sentence, but chose not to. In September 2002, Pakistan also asked Swiss courts to institute money laundering charges against Zardari, Bhutto, and their helpers, and to accept Pakistan’s claim that it had been damaged by their actions. In February 2003 the Swiss Court of Appeals agreed to hear the case, and in July 2003, a Swiss investigating magistrate ruled that Pinky and her husband were guilty of money laundering, fined them $50,000, awarded them a six-month suspended sentence, and ordered them to return $11.75 million that had been frozen in accounts at UBS and Barclays in Geneva, plus the necklace, to the Pakistani government. The case is now wending its way through final appeals, which could take years. But there is little doubt at the end of the day, the Swiss magistrate’s verdict will be upheld. After all, most of the documentary evidence in the case came from the office of Schegelmilch himself. It was further supported by the “hard evidence” of the necklace purchase and the frozen accounts that had financed it – if they did not belong to “BB and AZ,” how did she access them? Even if Pakistani courts were biased against her, as they undoubtedly were, Pinky had years to appear before Swiss courts and answer these charges. Separately, Pinky and Ali are still battling at least a half dozen other corruption cases, including a dispute over real estate holdings in the US, the UK, and France, and another $60 million of Swiss deposits that have been located, including $40 million at Citibank in Geneva, and millions more in 61 accounts at more than a dozen other banks, including Credit Suisse, Pictet, BNP (Paris) , Chase Manhattan (NY), Banque le Henin (Paris), and NatWest (UK). Zardari, who has been acquitted in three criminal cases, also still faces charges in several others – the government of General Pervez Musharraf seems determined to keep him in jail, in virtual solitary confinement. Pinky's mother Nusrat was also convicted of concealing her assets and sentenced to three years in 2000. ~A $2.4 million bribe allegedly paid by the Polish firm Ursus to the Geneva accounts of Dargal Associated SA, another BVI company reportedly owned by Zardari and Bhutto, in connection with the sale of tractors to Pakistan’s Agricultural Development Bank. ~At least $28 million in alleged bribes from ARY International Exchange/ Traders, a company allegedly owned by a Pakistani gold trader in Dubai, Abdul Razzak Yaqub. These payments reportedly flowed by way of Citibank-Dubai (account #342034), American Express Bank, and perhaps JPMorgan (NY). In October 1994, they ended up at Citibank-Geneva, in accounts owned by Zardari’s Bomer Finance, plus two more BVI companies that Schlegelmilch allegedly set up for him -- M.S. Capricorn Trading SA and Marvil Associated Inc. In December 1994, Bhutto’s government allegedly awarded an exclusive two-year import license for gold to Yaqub, which he used to import more than $500 million of gold into Pakistan. The prolific Schlegelmilch had reportedly set up all these accounts with the help of a Citibank private banker in Geneva, Kamran Amouzegar. In addition to all the fees he earned from the Bhuttos and SGS/ Cotecna, it turns out that Schegelmilch also struck a lucrative “referral” deal with Citibank, which gave him 20 percent of the first three years of client net revenues from each client he brought to the bank. In essence, he was collecting fees on every side of these transactions. It also turned out that key Citibank staff, including the bank's EVP for Worldwide Private Banking at the time, Hubertus Baron Rukavina, were well aware that Zardari and Bhutto were the real owners of these accounts. Yet they permitted the accounts to be opened and to be actively used as “pass-through” accounts. In 1999, a US Senate Banking Sub-Committee investigation concluded that “well over $40 million” had flowed through Zardari’s Citibank-Geneva accounts during this period, though it wasn’t able to pierce the veil of Swiss banking secrecy to learn precisely how much or where it went. 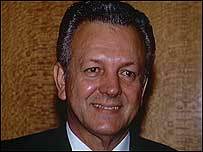 In 1999, the indiscriminating Baron Rukavina left Citibank for a leading German private bank, Sal. Oppenheim Jr. & Cie. KGaA , where he remained until 2003. In fact Citibank had long since been put on notice that Zardari’s funds might not be clean – after all, he’d already spent two years in prison on corruption charges in 1991-93, and Citibank’s CEO John Reed had been advised by Citibank staffers to avoid him like the plague when Reed visited Pakistan in February 1994. But Citibank only closed the accounts in November 1996, just a few days after Pinky was removed from power for a second time. At that point the bank swiftly transferred $40 million to another Geneva bank, Banque Financière de la Cité, where Pinky apparently had an account. In September 1997, at Pakistan’s request, the Swiss government ordered the Zardari and Bhutto accounts at Citibank and three other Swiss banks frozen. Unfortunately, by then the funds had fled. Only in December 1997 did Citibank bother to file a Suspicious Activity Report with the US Treasury’s Financial Crimes Enforcement Network with respect to these Zardari accounts – long after they were empty. ~The last two decades have also been rife with arms scandals in Pakistan, as the country pursued an increasing arms race with India, with much of the payola provided by Europe’s leading arms suppliers. All administrations appear to have profited from the traffic, and Bhutto’s was no exception. For example, Admiral Mansur-ul Haq, Pakistan’s top naval officer during the second Bhutto adminstration, fled the country in 1997, was arrested by US authorities in Austin at Pakistan’s request in 2001, charged with receiving bribes in connection with the 1995 purchase of three Agosta submarines million from the French firm DCN, Two of ul Haq’s subordinates were also reportedly convicted of corruption. Admiral Mansur, who reportedly had close ties to Zardari, was also charged with receiving $3.4 million in connection with the purchase of an Edrian minesweeper from France, missles from the French firm Aerospatiale, and naval equipment from Thompson-CSF. The Admiral was ultimately fined $7.5 million. ~In 1995, France’s Dassault Aviation was angling to sell Pakistan $4 billion of Mirage jets, after the Clinton Administration held up the sale of F-16s to pressure the Pakistanis on nuclear weapons development. Dassault and its partners in the deal, Thomson-CSF and Snecma, reportedly agreed to pay Zardari a whopping five percent commission ($250 million) on a $4 billion jet fighter deal, by way of Marleton Business SA, another BVI company controlled by him, if Pakistan agreed to buy 32 Mirage fighter planes. The offer was reportedly made by Dassault’s Director of Legal Affairs at the time, Jean-Claude Carrayrou, and Pierre Chouzenoux, its International Sales Manager, by way of Schlegelmilch to Zardari and Amer Lodhi, a Paris-based lawyer and banker who was reported to have previously worked for BCCI. The deal only fell apart when Pinky’s second administration was bounced from power in 1996. Zardari’s five percent commission was apparently a little light – in the case of Iraq in the 1980s, Dassault reportedly paid Saddam’s regime 7.5 percent commisions on its weapons sales. ~There have also been a plethora of other charges relating to hanky-panky in purely domestic matters as well, involving alleged kickbacks on rice deals, government land sales, and welfare agencies. All told, Pakistani prosecutors believe that the Bhutto/Zardari clan may have made off with more than $1 billion in payoffs and accumulated more than $1.5 billion in net assets during their brief four years in office. More important, Pakistan’s 150 million people, and the cause of Islamic democracy, may well have suffered incalculable damage at the hands of this corrupt elitist clan and its First World abettors. Together with Bhutto/Zardari’s licentious successors in Nawaz Sharif’s two failed governments, they clearly helped to undermine the popular association between democracy and the rule of law, and paved the way for the growing polarization between two anti-democratic alternatives -- military dictatorship and Islamic fundamentalism. Long term, it is this damage, and not some economist’s sterile “excess transactions costs, that is the real cost of transnational corruption. As for the Zardaris’ Swiss collaborators, there has been a modest amount of justice done, but scarcely enough, when one considers all the damage they may have done to Pakistan’s body politic. ~ Schegelmilch.. In July 2003, a Swiss investigating magistrate ordered Jens Schlegelmilch to reimburse Pakistan for the $2 million of compensation that he received under the SGS money laundering arrangement, and was given three years probation. This sentence is still on appeal. 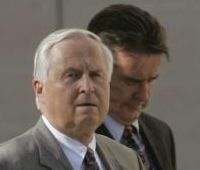 The other Pakistani cases involving bribery allegations against Schegelmilch are still under investigation. ~SGS. As for SGS and Cotecna, they found their Pakistani contracts cancelled for the second time. SGS was still permitted to operate in Pakistan, and received no criminal or civil penalties. In February 2003, SGS asked The International Centre for Settlement of Investment Dispute (ICSID) to consider a $128 million claim for Pakistan’s termination of its PSI contract. In July 2003, the ICSID decided that it had no jurisdiction, forcing SGS to seek an out-of-court settlement. The matter is still unresolved. The Pakistani events also triggered a period of embarrassment and internal crisis at SGS. In October 1997 SGS sold Cotecna back to its previous owners, the Massey family, after it was convicted of bribing Bhutto and Zadari. In September 1998, SGS’ entire board of directors and Ms. Elisabeth Salina Amorini, its rather autocratic Chairman since 1989, were forced to resign. SGS’ new management instituted numerous face-saving practices, like the appointment of an Ethics Committee, the drafting of an ethics code that was translated into 25 languages, a “Six Sigma” quality program, and a new mandatory “business ethics training course” for senior managers. All these changes reportedly helped SGS to restore the confidence of institutions like the World Bank in its practices. In the wake of the Pakistan case, SGS also suffered a string of key contract losses in the Philippines, Angola, the Ivory Coast, Ethiopia, Indonesia, and Paraguay. Most of the cancellations were not directly related to the Pakistani case, but some of them did involve allegations of improprieties and high-level chicanery. In the case of Paraguay, for example, a 2001 audit by Paraguay’s Controller General disclosed many “irregularities” in PSI contracts that had been negotiated with SGS and BureauVeritas by the administration of former President Juan Carlos Wasmosy, who governed the country from 1993 to 1998. In 2002, Wasmosy was sentenced to four years in prison in an unrelated bank fraud case. In the case of the Philippines, in 2000 the government of President Joseph Estrada cancelled one of SGS’ most lucrative PSI contracts, claiming that it was not saving the country any money. The real motives may have been much darker. SGS’s contract, reportedly worth more than $100 million a year, had been procured with the help of the “Sultan of Spin,” influential Manila PR consultant Salvador “Bubby” Dacer, who had also served as a PR advisor to President Estrada. 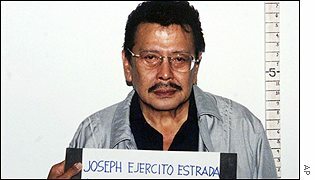 In November 2000, Dacer was abducted and murdered in Manila by a group of policemen, including several members of Estrada’s Presidential Anti-Crime Task Force, amid rumors that Dacer had found out more than he needed to know about high-level corruption, including the evasion of import duties. The murder trial is still pending. In January 2001, President Estrada himself was ousted on corruption charges, and SGS is still pursuing a $100 million claim against the Philippines before the ICISD. Despite such setbacks, by 2003 SGS’ overall business had recovered nicely, with revenue reaching $1.7 billion – less than 12 percent of it from PSI contracts. SGS still remains one of the leaders in the PSI field, providing such services to about 30 developing countries, including Haiti, Madagascar, Zimbabwe, Mexico, Indonesia, Ethiopia, and Cameroon. But it is now refocused on testing and certification services for private companies, and new business opportunities like the certification of eco-tourism operations , preferring to let even less scrupulous competitors take the lead in PSI. ~ Cotecna. One of these may well be SGS’s former subsidiary, Cotecna, (http://www.cotecna.com), the original source of the PSI bribery in Pakistan. As of 2003, Robert M. Massey, who signed the original June 1994 commitment letters promising kickbacks in exchange for contracts, is still listed as Cotecna’s CEO. The company claims a workforce of 4,000 employees in 150 offices in 100 countries, with PSI contracts for many of the developing world’s most corrupt hotspots, including Nigeria (since 1987), Ghana, Kenya, Senegal, Venezuela, Colombia, Ecuador, Niger, Peru, Iran, Togo, and Nigeria. But not, of course, Pakistan. Interestingly, in 1992, and again in January 1999, Cotecna Inspection S.A. secured a contract to inspect Iraq’s compliance with the “oil for food” program. Are we expected to believe that it was a sheer coincidence that Kojo Annan, UN Secretary General Kofi Annan’s son by his previous marriage to a Nigerian woman, worked at Cotecna S.A. as an “senior staff member” until late 1997, and then became a partner in a Nigerian oil trading company whose clients reportedly include Cotecna? The youthful Kojo (now 30) has indeed been a busy beaver. In 1999, when he was just 26, one of his other clients, a Nigerian company called Sutton Investments, won a six-million-British- pound subcontract from Cotecna to help monitor the UN's oil-for-food program in Iraq. 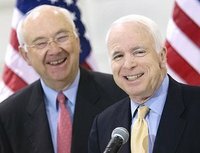 And since 1999 he has also served as a Director of Air Harbour Technologies (AHT), an Isle-of-Man company that came out of nowhere to win a 1995 tender to build a controversial new multi-billion dollar airport in Harare, Zimbabwe, from the widely-loathed Government of Zimbabwe’s Robert Mugabe. AHT’s CEO is Hani A.Z. Yamani, the son of Saudi Arabia’s former Oil Minister Sheikh Yamani. Kojo is reportedly helping to develop new hotel projects in Abuja, Nigeria’s capital, and Accra, Ghana. PSI SERVICES – THE JURY’S IN. During the PSI heyday of the 1980s and early 1990s, the World Bank and the IMF went around encouraging poor countries to “outsource” their customs departments to PSI providers like SGS and Cotecna. Quite a few did so – the number of developing countries mandating pre-shipment inspection increased from 20 in 1990 to 44 in 2003. ~While PSI has had a few short-term “successes,” in terms of increased customs revenues and reduced corruption, there have also been many disasters, like Pakistan and Argentina, or cases where there appears to have been little net benefit, as in Indonesia. ~The direct and indirect costs (including kickbacks) of PSI outsourcing are very high – an average of 1 to 1.5% of country imports per year. Yet the information gathered by PSI firms often goes to waste, completely ignored by contracting governments. For example, SGS estimated that it found $650 million of uncollected import duties in Pakistan alone in 1995-96. And a recent World Bank study estimated that 50 percent of potential revenue gains from PSI services were lost because governments simply failed to use the information gathered. In other cases, as in Pakistan, PSI just allowed officials to extract more payoffs from importers. ~Even in the Philippines of the early 1990s – a case sometimes cited as a success story -- the benefits of PSI declined sharply over time, as more and more imports were diverted to free trade zones and then smuggled in. Indeed, this increase in “insider” smuggling may have been a key factor in the Estrada/ Dacer scandal noted earlier, and the cancellation of SGS’ Philippines’ contract. Similar effects on smuggling have also been noted in countries like Mozambique and Argentina. ~Longer term, there is simply no substitute for countries developing their own tax collection and judicial systems – as, indeed, most First World countries have tried to do, at least for crimes within their own borders. Yet many of the world’s most corrupt countries, like Bangladesh, Nigeria, and Kenya, have now used PSI services for almost two decades, and their customs and tax collection bureaucracies have actually become even more corrupt. There are signs that some developing countries may be recognizing some of these lessons about PSI. For example, Argentina and Zambia recently terminated their requirements for mandatory pre-shipment inspections of imports, substituting alternative methods of regulation like minimum import prices and cross-border information exchanges. Especially in Latin American, a growing number of countries are also contracting with with multiple PSI providers at one time, hoping that this will increase the competition among them. Indeed, in the perfect-market long run envisioned by neoliberal idealists, the liberalization of exchange rates and the abolition of tariffs and quotas, combined with the free flow of information about prices and products across borders, will eventually eliminate the need for PSI services entirely. In fact there has already been a tendency for the PSI business to slow down, partly because world trade has stagnated since 1999, and partly because levels of customs duties are declining, at least for “middle income” countries in Asia and Latin America. At the same time, PSI industry leaders have seen their other global businesses expand, as ‘non-tariff barriers” like product standards and quality certifications have displaced tariffs as the key obstacles to developing country exports. However, the fact is that even today, many of the world’s very poorest countries still have sole-source contracts with PSI providers – including 22 out of 23 African countries that use PSI. And the number of countries using PSI providers has increased from 37 to 44 in just the last four years. Why, despite everything we’ve seen, is this happening? The critical point here is “duty addiction” noted earlier. This addiction is grounded in a set of very practical financial realities that are faced by the world’s poorest countries. ~First, when wide-open capital markets are combined with offshore havens and our highly-efficient international private banking system, political influence, weak judicial systems, and poor transnational tax enforcement, it is should not be surprising that developing countries find it almost impossible to tax the incomes, profits, or wealth of their private elites and corporations -- much less foreign corporations. This helps to explain why the share of taxes accounted for by income and property taxes for developing countries is significantly lower than in high income countries – and, indeed, why this share has declined significantly since the 1970s, while it has actually been stable or even increasing among high-income countries. For example, for the 65 developing countries that the World Bank considers “low income countries,” with per capita incomes in 2002 below $735, the median share of all tax revenue derived from taxes on income, profits, and capital gains declined from 19.8% in 1975-79 to 18.1 percent in 1998. For 88 “middle income countries” with gross natiional incomes in 2002 between $735 and $9,075. 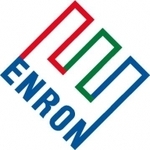 this share declined slightly, from 18.4% in `1978-81 to 17.8% in 1993-2001. (Data for identical years is not available for the two series.) For 24 “high income OECD countries” with per capita incomes greater than $9075, the median increased slightly, from 27.8% for 1975-79 to 31.2% for 1993-98. Overall taxes as a share of GDP increased for OECD countries from a median of 19.5% in 1975-79 to 25.6% for 1993-97. For the US it rose from 17.1% in 1975-79 to 19.4% in 1998-2002. ~Second, domestic markets are often very thin, or are dominated by informal and barter transactions that are hard to tax, especially in countries where the rural sector still accounts for a substantial share of the economy. In practice, this means that sales taxes are difficult to levy in developing countries. ~Third, foreign trade, in contrast to private incomes or domestic sales, is relatively easy for developing countries to tax, as a kind of luxury. It is often dominated by a relatively few importers or exporters with relatively high income. Smuggling is always a problem, but in many countries trade flows can be channeled through a handful of entrepots. At the same time, when combined with offshore havens and weak law enforcement, high tariffs also provide juicy corruption opportunities for government officials. These realities also help to explain why, as shown in Table 1 , Click for Table 1.
among the top 50 countries that have been the most important customers for PSI services, as well as the world’s most corrupt (according to TI) countries, as a group they still rely on import duties for 24 percent of tax revenues, only a slight reduction from their 1970 levels. And there is huge variation around this median, with countries like Bangladesh, Togo, Madagascar, Benin, Senegal, Uganda, Liberia, the Central African Republic, and Niger relying on import duties for more than 30 percent of their tax revenues. Indeed, hard-pressed countries like the Ivory Coast, Cameroon, the Congo, Ethiopia, and the Sudan even tax their own exports at significant 10-14 percent to raise taxes. For OECD countries, in contrast, export duties have long been viritually zero, while import duties have also nearly disappeared as a source of tax revenue – in 2002, they accounted for just 1.2 percent of all tax revenue in Switzerland, 1 percent in the US, and zero in the UK. Furthermore, these developing countries are having a difficult time collecting taxes in any form. Indeed, total tax revenues as a share of GDP is also much lower for low-income countries – in 2002, taxes as a share of GDP averaged just 15 percent for them, compared with 25 percent for high-income countries. So much, therefore, for the simpliste version of supply-side economics, according to which excessive taxes are the root of all evil. In fact the tax yield is so low in many countries -- less than 9 percent of GDP in Nigeria, Bangladesh, the Congo, and Haiti -- that public services like health and education are drastically underfunded. So just the opposite is true -- the vast majority of residents of these countries remain poor, in a sense, precisely because their tax systems are so weak and porous. It is all very well, therefore, for First World countries to proclaim the need for free trade and wide-open capital markets. But under the prevailing rules of the game, most of the world’s poorest governments have few alternatives to customs duties as a source of public revenue. Meanwhile, as we've seen, the same global haven system that compels these countries to rely so heavily on customs duties also provides their officials with the opportunity to abscond with a hefty portion of the revenue to havens like Switzerland, London, and the US, where wealthy foreign nonresidents are permitted to virtually live tax free. It also facilitates the provisioning of services from Swiss companies like SGS, when it comes time to cleaning up the mess back home. So the global PSI industry is part of a much larger story. Its barons and bankers are not especially malevolent or cruel. They are, in fact, rather decent chaps, who enjoy the good life and undoubtedly wish no one any harm. The institutions they've built have merely seized on all these contradictions in the system and used them to extract nice annuities for their services, minus the occasional tip to the locals. Is that not a perfectly normal human response to the call of opportunity, advantage, and impunity? (c) James S. Henry, 2003. Not for quotation, reproduction, or any other use with the express consent of the author. All rights reserved.